This one is a man’s tobacco pouch. They carry it on their belt like that, all the time. Later on, we used to make shell bags for the men like that. Siberian and St. Lawrence Island Yupik tobacco bags were decorated with geometric designs made from strips and patches of bleached, alder-dyed, and black skin. 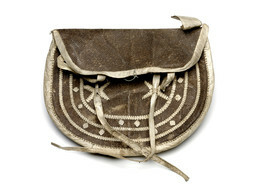 A similar type of bag was used to hold gun cartridges for hunting. Estelle Oozevaseuk said, “That is shaven skin. They tried to use a thin hair seal, shaved it, and made it into these. Again there are those stitches. We called them siklapegtaq [stitching in a toothlike pattern]. Estelle Oozevaseuk: I think that is a man’s tobacco pouch made out of intestine—qaliqenghaaq [strip of dried bearded seal or walrus intestine]. They carry it on their belt like that all the time. And later on, we used to make shell bags for the men like that for their guns, uunghun [man’s sealskin bag to carry gun shells]. And they carry it over their parka, depending on what they wore. It was very handy for them to use that. The tobacco pouch on belt is qantanguraaq [pouch worn on a belt] we call it. (2) There’s another name for the one they carry like that when they go out hunting, uunghun. Grandpa used to carry that. We were very curious to see what was in it. We would try to open that up and see what was in it when we were little kids, me and my brother and cousins. Marie Saclamana: Put the belt through here [loop]. Estelle Oozevaseuk: I’ve made so many things like that and bigger than that. Sometimes they asked me to make one that big is for .22 rifle shells. And the bigger ones are for bigger shells. Jacob Ahwinona: I have one at home. My mother made me one from a wolverine head [skin], a shell pouch for keeping my shells. 1. This tobacco bag was discussed along with tobacco bags E316649 and E316663. 2. According to St. Lawrence Island Yupik Elder Vera Kaneshiro, this is called a qantaqusiq [man’s tobacco bag], and men used smoking tobacco, chewing tobacco and snuff. 3. Hair seals—also called true seals—refer to various types of earless seals (family phocidae) including harbor seals, bearded seals, ribbon seals, spotted seals and ring seals—excluding fur seals (an eared seal). 4. According to Vera Kaneshiro, siklapegtaq is often made using black thread—made by drawing sinew through graphite—along a strip of white winter-tanned, scraped sealskin on small bags.